Joe Cohen and Jack Harper were friends and competitors who had no idea that, many years later, their two shops would become one. In 1926, Cohen opened The Young Men’s Shop on 11th Street in Altoona. Meanwhile, Penn State alum Harper opened his “custom shop for men” on West College Avenue in State College, in partnership with George and Ken Stark, two brothers he had met in college. In 1938, Harper bought out the Stark brothers and renamed the store Jack Harper, Custom Shop for Men. Cohen’s son, Joel, joined him in the retail business during the 1950s. In 1982, The Young Men’s Shop opened a State College location on Calder Way. Joel’s son, Brian, started working in the family business in 1985 after studying marketing at American University in Washington, DC. In 2000, he guided the merger, joining Jack Harper’s and The Young Men’s Shop together at the historic College Avenue location. For 90 years, three generations of Harper’s Shop for Men retailers have dressed thousands of local customers for formal dances, graduation ceremonies, and their first jobs. The Cohen family and Harper’s Shop for Men are proud to continue the tradition of community connections, top-quality merchandise, and personal service started by Jack Harper and Joe Cohen in 1926. One longtime tradition Brian Cohen maintains today is sponsoring and handing out the Joe F. Cohen Blanket Award each year at Altoona and Bishop Guilfoyle high schools. It is awarded to a senior football player who best exemplifies integrity, honesty, sportsmanship, and success on and off the field. Started by Joe Cohen early in his career, the awards are believed to be the oldest football award in the country, surpassing even the Heisman Trophy in age. 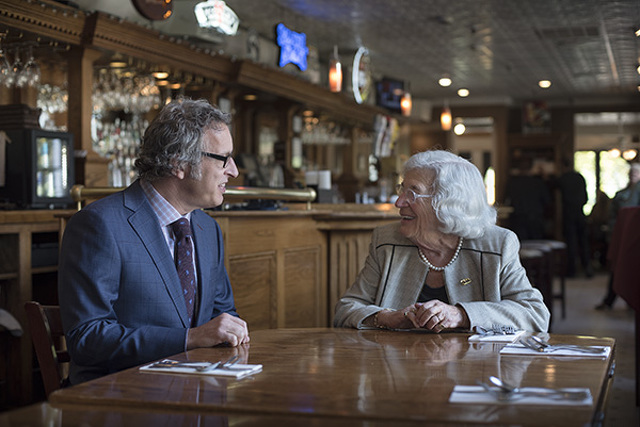 Town&Gown founder Mimi Barash Coppersmith sat down with Brian Cohen at the Allen Street Grill in State College to discuss the family retail business, his future plans, and how he feels about the recent growth of downtown State College. Mimi: Here we are, celebrating the 90th anniversary of Harper’s in State College and Young Men’s Shop in Altoona. Both started in the same year, in two different places. Brian: I know — that’s amazing and ironic. Mimi: And here you are, the third generation, running a store that incorporates both of their names. How did you come about doing that? Brian: In 2000, we merged the Young Men’s Shop with Jack Harper’s. It was a great opportunity. Jack Harper’s has an amazing location in town. Mimi: And an amazing reputation. Brian: A reputation that decades and decades of Penn Staters and people from State College recognized, and most of those same people were familiar with Young Men’s Shop in State College since 1982. Through the years, we have developed a great loyal following. At that time, it made sense bringing the two stores together. Mimi: When I was first in State College. Harper’s had a lot of competition. Brian: When the Young Men’s Shop opened here in 1982, there were four other men’s stores in town. There was Herrs, Levines, Jack Harper’s, and Bostonian — all men’s specialty stores. And there was also a small sportswear store that carried men’s. Brian: No, but that’s part of the story. Kalen’s closed in 1981. My father saw an opportunity for a young men’s shop to open in this market. That was the time when Sid Friedman was developing Calder Square II. He approached my father, and at that time we were the only anchors in that building. We opened it up in 1982. Mimi: You had both men’s and women’s in your store? Brian: Yes. In 1982, it was probably about 60 percent men and 40 percent women in our store. Mimi: But there’s no store for women now? Brian: We do not carry women’s fashion at present, but we’re working on developing that part of our business. Right now, that category is sorely missing, and I think there is a great opportunity for someone to come and do that. Downtown State College has the ability to support multiple women’s clothing stores. Mimi: I have been looking forward to that for a long time! Let’s talk a little bit about downtown. There’s so much volatility here in downtown State College with major closures. Brian: I feel resurgence now with these new buildings. There are other buildings rumored to be built, too. Mimi: Does your business suggest that? Brian: I remodeled my store in the fall of 2012. That’s also when we expanded Harper’s to the back of the store and added Harper’s Varsity Club. And with that refreshing and remodeling of the store, we’ve experienced steady growth in the last 3 1/2 years. I have always believed in reinvesting in my business. I always noticed that my grandparents and my parents — it seemed that they were always doing new things to the store. Mimi: Was your grandfather an immigrant? Brian: No. My grandfather, my father, and I were all born in Altoona. His family was from Ukraine and Poland — they all came over. I guess Altoona was a popular destination. Mimi: The way people dress today, the millennials, has to impact your kind of business. Brian: Definitely. The way people dress today is more relaxed. The interesting thing that I am noticing with the current generation — guys graduating college — they seem to be more interested in clothes than people 15 or 20 years ago. Mimi: Why do you think that is? Brian: Well, not to blame their fathers, but I think lots of the men in their 50s and early 60s, those were the men who went to work in the time of “casual Fridays.” And I think younger guys, they see that, and they are doing what they can to be different. I have also heard that from other retailers from other parts of the country. Mimi: Better clothes are selling better? Brian: Yes, I am seeing that. Some people just want better things. College kids come in today and they ask for suits for interviews, and they ask for a particular type of suit. You know, decades ago, when students needed a suit, they would come to us and we would educate them about their choices. The young consumer today knows what kind of style they are seeking, and it’s up to us to provide that to them — and that is a positive thing for apparel. Our downtown is definitely a destination because of the university and hundreds and thousands of alumni. We are lucky to have that kind of destination. Mimi: As a young merchant downtown, how do you get downtown to work better than how it has been able to through the years? Brian: That’s a good question. We do have our Downtown Improvement District, which works very hard to accomplish numerous downtown events, like the summer music festival, fall festival, and first Fridays. I have worked and continue to work with other retailers, and we have done our own grassroots marketing together. There might be five or six of us, pulling our customer base together, reaching out to people. Mimi: It is harder to be in business today than it was 25 years ago because there’s far more competition. Brian: There is a lot of competition in State College between Joseph Banks, Men’s Wearhouse, and Macy’s. They hang a lot of tailored clothing in their stores. We have our own thing, but we definitely compete directly with them. But I think we do a lot of things differently, and hopefully we do many things better than they do. That’s always our goal. … Going back to talking about how people dress today. People don’t shop for clothing as frequently as they once did. In the 1980s, guys used to buy suits five or six at a time, twice a year, because they needed that for work every day. But now people don’t dress like that. Even the guys who wear suits frequently don’t dress like that. The challenge is how to make people think “I am a choice” when they only buy a suit every five or six years. Mimi: You have made a choice of maintaining a high level of quality in merchandise. What is your secret? Brian: I always hear this from my father. It doesn’t matter that your product is good or bad. What matters most is the people and the service in the store. People can go shopping wherever they want. Our focus has always been on people and the experience we can provide them in our store. I am very fortunate that I have a really good staff, and I have had, over the decades, great people work for me. And I think that has been our strongest asset. Mimi: Not the merchandise that’s bringing people back — it’s the people. Brian: Right. But we have to have compelling products — people have to like what we have. But yes, it’s the relationships. In the end, everything is about people. That is one of our competitive advantages. Mimi: What advice would you give for people who might want to open up a women’s clothing store. Brian: I think you would have to focus on your staff and your customers, not as much the products. Mimi: It is easier to get the inventory. Brian: It is definitely work planning, following your numbers, trying to put together a buying plan season after season. Staff is definitely more of a challenge. But making your place warm and welcoming is going to take you a long way. Ultimately, when customers come in, they want to enjoy their shopping experience. If they are choosing to walk into our store, we deeply appreciate that and want to provide them a relaxing, no-pressure experience. We have a really easy-going return policy. One thing I always tell my staff is that the return sell is harder than a regular sell. When someone walks through your door and they need to return something, it’s already like, “I gotta do something, but I don’t wanna do it.” I think if we are good at that experience, it is going to make us friends. And that really helps us build our clientele. I would tell someone, have a really good return policy. That will make people feel good about buying from you and shows that you care about them and their satisfaction with the experience and the products, even after they’ve left the store. Mimi: I think the Internet has definitely changed our business. Brian: We are slowly growing our online business. I have to make sure when people come to Penn State they would want to shop with us. There are so many Penn Staters. We are still learning how to reach those customers. Because of our online presence, new alumni customers are finding us for the very first time, and when they come into town, they want to visit the store for the first time! That’s exciting! Mimi: How has the industry changed? Brian: Obviously, no two people are alike, and in fashion, we are seeing customers seeking a more individual approach to their unique desires today, so we have to be more creative. I have seen a real growth in our custom business, and it has been growing around the country, stores similar to mine. You bring in your pictures, we can design and create that exact suit and custom lining. It is much more personalized. Customers are interested in creating their own style, and we help them do just that! Mimi: What are you planning next? Brian: Well, exciting news — we are moving! Mimi: Where are you moving? Brian: We are moving in late spring of 2017 to the Storch Building beside The Tavern. Our new space will create a multilevel store. We will have a grand opening celebration next fall. The new store will be approximately 6,000 square feet. We will be doubling our size. Mimi: Are you going to consider selling women’s clothing? Brian: We are going to have women’s clothing again. We are very excited about the trends and fashion we are seeing and will be featuring at the new store. It is an exciting opportunity to offer women’s apparel again! Mimi: You obviously have a lot of optimism about your future. Brian: I do! I love what I do, and I hope it shows when people walk into Harper’s. I love being downtown — there’s no better place for our business! Mimi: I agree with you. We need to attract more stores like Harper’s here in State College. We started this interview celebrating your 90th anniversary, and you are taking it to a new level. I wish you the best.